In the nineteenth century, coffee from Puerto Rico was known as the coffee of Popes and Kings. Since that time, disasters - both natural and man-made - resulted in a dramatic decline in Puerto Rico coffee production, causing Puerto Rico to become a net importer of coffee. The growth of interest in specialty coffees over the past decade has spurred production, making it possible for us to once again enjoy this fine Caribbean coffee. Famous for its rums, Puerto Rico was not, until fairly recently, well known for its coffee. However, this was not always the case. Some of the first coffee plantings in the New World were established in Puerto Rico in 1737 by Spanish immigrants. Puerto Rico is ideally situated for the cultivation of coffee. The island's Cordillera Central (central mountain range) offers just the right altitude to keep temperatures between 65 and 80 degrees Fahrenheit. Good fertile soil, known as "humata arcilloso", and just the right amount of rain complete nature's input. By the 1890s, Puerto Rico was the sixth largest coffee producer in the world. Puerto Rican coffee enjoyed a first class reputation and surpluses were exported to Europe where it was 'the coffee of choice' at the Vatican. Then, events contrived to reverse the fortunes of the Puerto Rico coffee industry. In 1898 the island was hit by two hurricanes which devastated Puerto Rican coffee production. In the same year, Spain ceded Puerto Rico to the United States at the end of the Spanish American War effectively ending 400 years of colonization. This meant that Puerto Rican coffee could no longer enter Europe tax-free as a colonial product; it was now subject to duties. And the United States, under whose sovereignty Puerto Rico now fell, had a long standing agreement with Brazil for the supply of coffee. Despite these substantial setbacks, Puerto Rico continued to produce coffee on a reduced scale, shored up by a Government guaranteed minimum price, but supplies were inadequate to meet even local demand. Fortunately, the establishment of the specialty coffee industry in the 1980s and its boom during the 1990s revived Puerto Rican coffee production, and in the last ten years, coffee lovers have once again been able to enjoy coffee from this region. 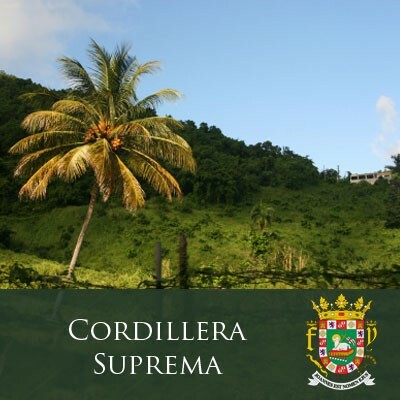 We invite you to try our gourmet Puerto Rico coffee, Cordillera Suprema, available in a Dark Roast.